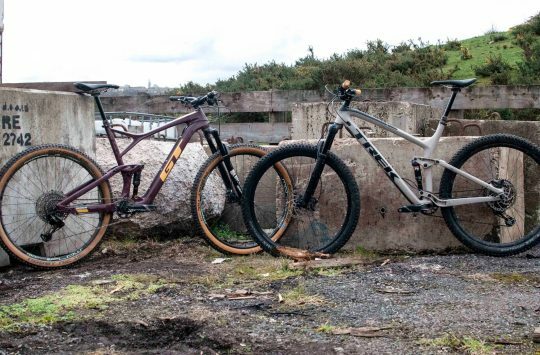 Fox has released details of its 2016 model range this week. Chipps was one of the privileged few who got their hands on a 2016 fork/shock pairing a few weeks ago and his initial impressions are very positive – to read more, you’ll need to get hold of a copy of issue 97, which is out next week. It’s goodbye to the open-chamber damping previously found on Fox’s lower-end forks. The familiar FIT (Fox Isolated Technology) damper now spans the whole range, from Performance to Factory, and in its new FIT4 guise it’s been given a new damping adjustment system – Climb/Trail/Descend is now a thing of the past, replaced with Open/Medium/Firm. Top-end Factory series kit also includes low-speed compression damping in Open mode. All forks feature a new, twin-chamber FLOAT Air Spring. Positive and negative air chambers are claimed to offer smoother performance with reduced friction, and be 125g or so lighter depending on model. Performance is tunable with volume spacers, too. 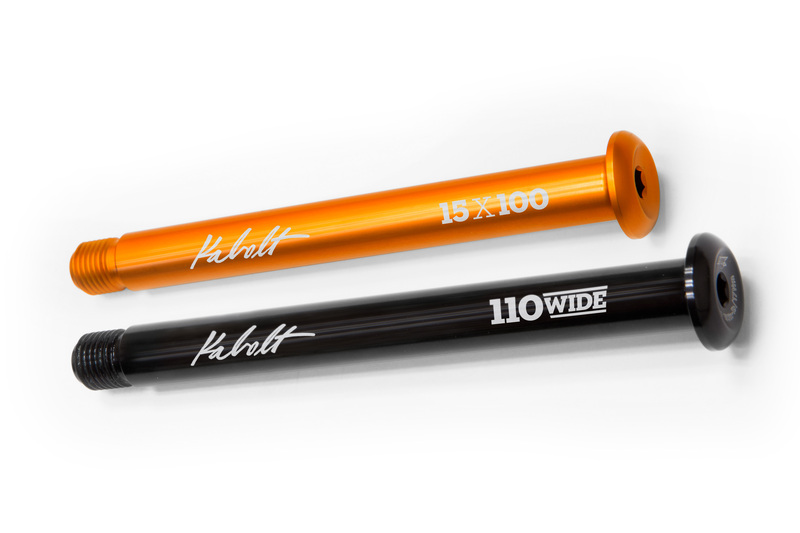 40 Series = 40mm stanchions, 203mm travel, downhill, triple clamp, available in 27.5 and 26in, new FLOAT air spring. There’s also a 34 27.5+ fork in 120/140mm travel options (which will accommodate a maximum tire size of 3.25in), and a 36 831, which will be of interest to 26in die-hards and those running older frames. 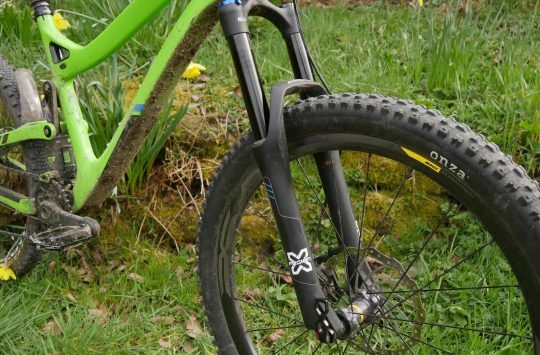 It’s a dual slalom/dirt jump fork, but it’s only available in 26in, and has a straight 1 1/8in steerer option as well as the now-standard tapered. The special stuff: 34 27.5+ and 36 831 for dirty pursuits (and potentially retro fans). The new air shocks are visually striking, with a bulbous EVOL (Extra Volume Air Sleeve) body increasing the volume of negative air, which should reduce the force required to initiate travel and speed up actuation. Fox claims that it will provide a more linear spring curve – which will also be adjustable via volume spacers. Float DPS: The do-everything shock. 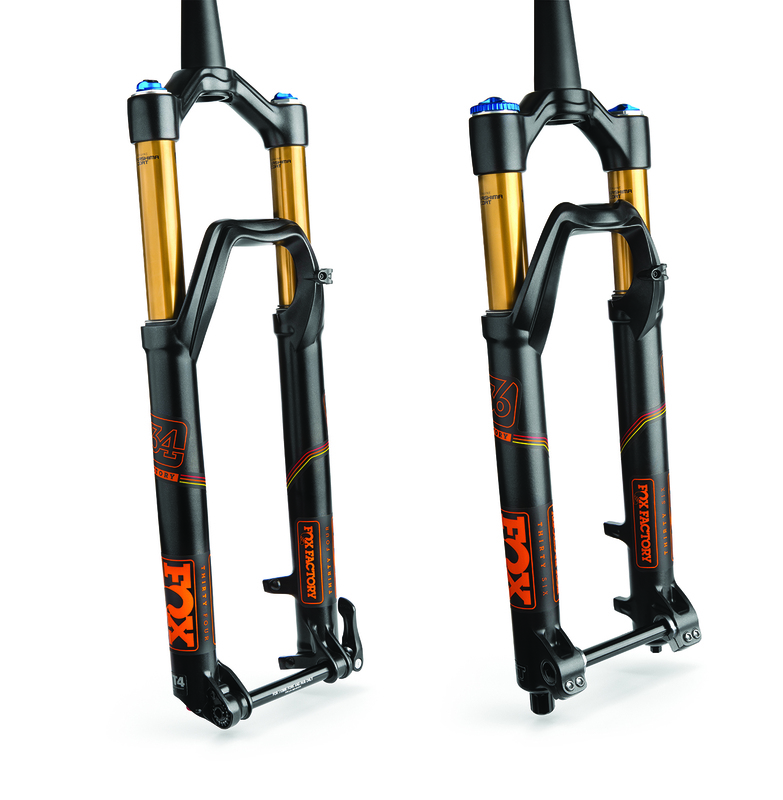 DPS stands for Dual Piston System; this damping system has five damping circuits – yes, five – to manage high and low-speed compression/rebound and lockout, and Fox says it “provides full lockout without compromising bump compliance, ride control and efficiency”. The Float DPS has the EVOL air sleeve, and the Factory version also has low-speed compression adjustment on Open. Float X: Aimed at enduroists and enduroistas, with EVOL air sleeve and a new damping tune “for compliance and control”. Again, the Factory version has low-speed compression adjustment in Open. 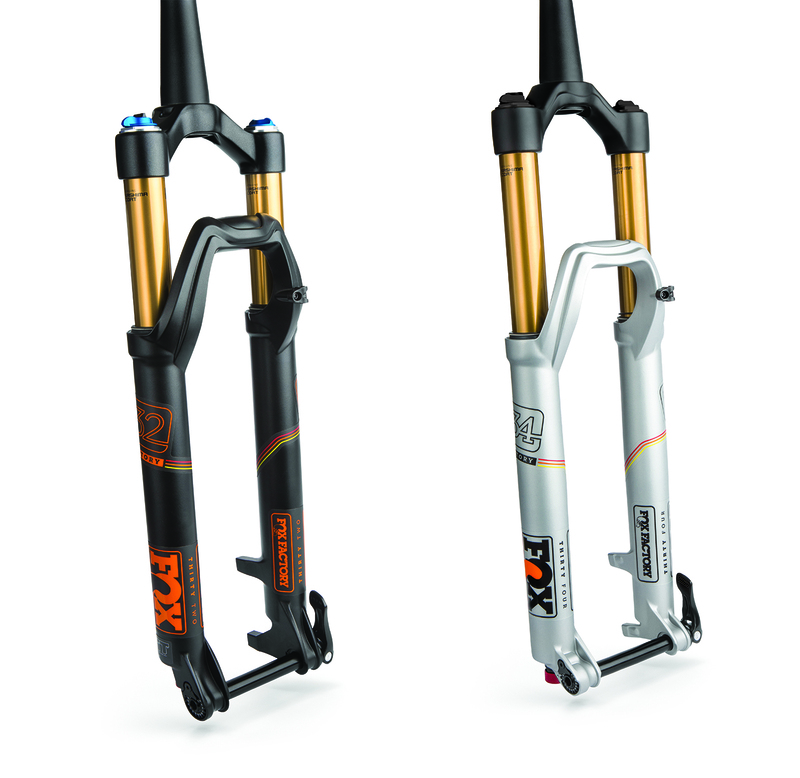 Float X2 Air: Top-end air shock, with RVS (Rod Valve System) damping technology: a new damper with independent high and low-speed compression and rebound damping. There are also reversible twin valve stacks to change the tune. Float X2 Coil: For the gnarly dudes. As above, and with new SLS (Super Lightweight Steel) spring option – thinner wire, fewer coils, and proprietary surface treatment and stress relief process. And of course there’s the Kabolt axle we reported on recently, which allows you to replace your 15QR with a claimed 40g lighter, one-piece bolt-thru (and of course the 6mm hex key to fit/remove it with). France wins at enduro. Again. 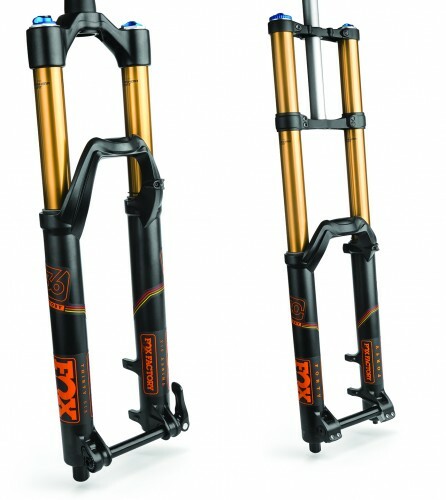 Yay, a 26″ 1,1/8 fork, I’m looking for a good 140mm ish one of those. Ok its a 32mm one, but the 140 and 150mm ones run in my group are still going strong. Hang on, the article says 32s will only go up to 120mm, and isn’t the 831 coil sprung and heavy? So we’ll get a (coil sprung?) heavy 100mm (maybe 120mm if we’re very lucky) 26″ fork that won’t sell enough units because it’s short and heavy and will be dropped from range whilst proving that fox never need to make another 26″ fork because when they do no one buys them? Or am I just being pessimistic? The 36 831 is aimed at dual slalom/dirt jump riders, so yes, it probably will be fairly sturdy, and it’s got 100mm travel so yes, it’s fairly short. Ye olde 1 1/8 steerer fork is becoming a rare thing though, so we thought it was worth flagging up for those who are interested. According to the US price list 32s and 36s are all available in 26in (though obviously that doesn’t mean they will be brought into the UK). here’s hoping they make over here (and with a 1.125 steerer). I really could do with a new fork. Any news on 2016 iCTD (iOMF?)? Sounds like a good step forward. What I’d like to know is can we retrofit the new FLOAT springs and FIT4 cartridge into previous model forks…?